This one, let’s call it Mucho Ado About Nada, is set in Monterrey, during the Mexican Revolution in 1914. It’s an interesting period. I once gave a lecture at the Gran Hotel Ancira in Monterrey where Pancho Villa had stuck his knife in the beautiful lobby woodwork to tether his horse. There was a plate of glass over the knife mark. There’s a hotel in Arizona which bears his horse’s hoof prints on the staircase too. He wasn’t confused between hotels and stables, but making a political point. Matthew Dunster has A Tale of Two Cities running at Regent’s Park Open Theatre at the same time, and that has had some very negative reviews … I haven’t seen it … for connecting the French Revolution to Syria in a mix-up. 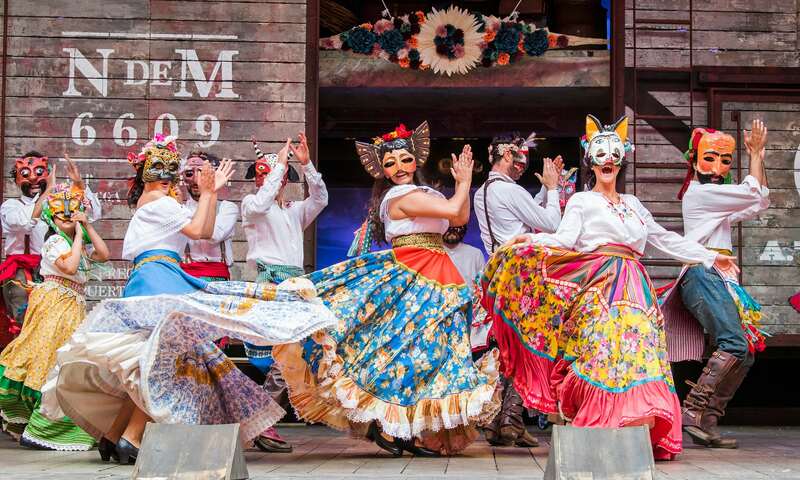 The Mexican Revolution seems a more reasonable setting for a play which Shakespeare placed in Messina in the extended part of the Spanish European Empire. At least we have Spanish names in Don John and Don Pedro … but no, this is the Globe. Or rather London theatre 2017. So the evil Don John has become Juana. Antonio has become Antonia. 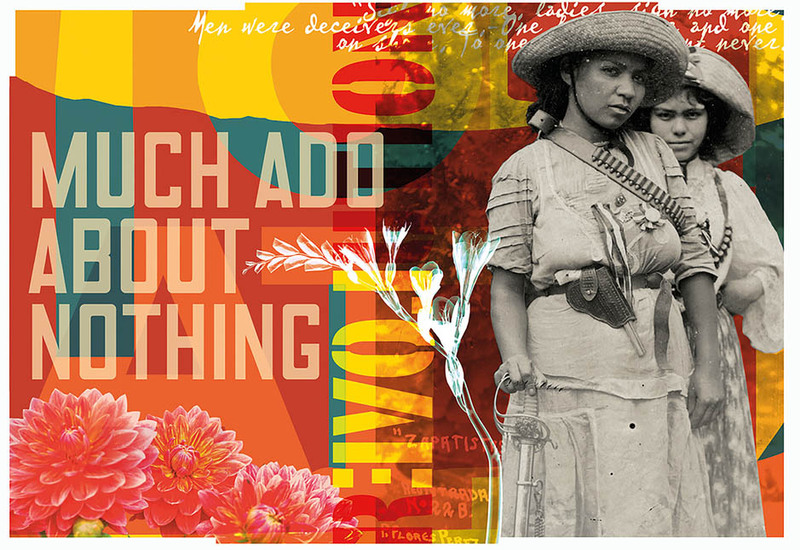 That fits, in that the Mexican Revolution, as photos show, was gender mixed. Why the Mexican Revolution? Why not? 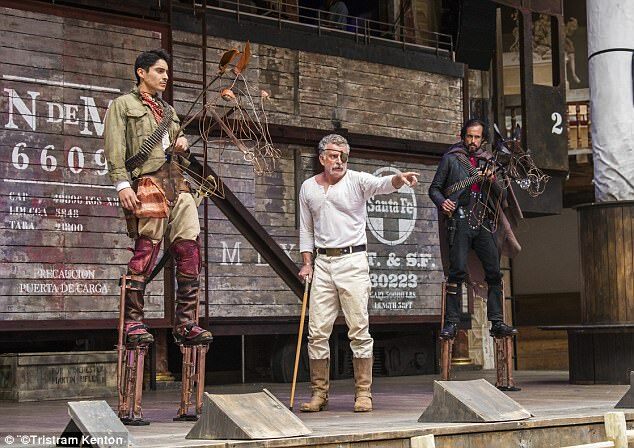 The Old Vic set the play in 1945, the RSC in December 1918, both in the aftermath of battles, as here where they’re presumably retreating from a Pancho Villa battle, and the programme says they thought of Don Pedro as a Pancho Villa character. The last time The Globe did it in 2014, it was just modern dress. I don’t think I’ve seen Much Ado in 16th/17th century costume because the play, like The Dream, slides easily into different time periods. It has a full set, a train carriage, and it starts with the cast riding on the roof, and steam comes from the underside. As through much of the play, trumpet and percussion propel us onwards. It looks and sounds great. The purists will argue that the existing balcony serves for a Mexican house very well, and though the basic Globe has been adorned with Roman bits or modern bits, it has not to my knowledge been totally covered and obscured from side to side before, though Matthew Dunster did try with plastic curtains in Imogen last year. Is it a great set for the play? Yes, it is, full of sliding doors and possibilities, and there is a shrine to the Virgin Mary around one of the outer pillars. There’s also a platform out in the pit, used in the first half as Juana’s standpoint, and in the second as Hero’s faked grave. The trouble is, the point of The Globe wasn’t to build sets across its width, however marvellous they might be. Costume is stunning … it’s so vibrant and colourful, and the skirt twirling dances are a riot of glowing hues. More on this later. The play inevitably rests on Beatrice and Benedick’s relationship, played by Beatriz Romilly and Matthew Needham. They both turn in memorable performances. Matthew Needham is given a lot of room to address the audience and interact with the audience, something which utilises the Globe shape and space. The addition of tequila and getting drunk in the early Beatrice and Hero scene is original and very funny. We know in every version that Beatrice and Benedick have encountered each other before and dislike each other. A broad hint here was that they knew each other quite well when Beatrice’s line You always end too soon … brought the house down, and no, as so often, it’s not the original line. There was marvellous business on the Benedick excuse that he has toothache (to excuse his mood). Here it’s justified because he has just stuffed an incriminating piece of paper in his mouth, he’s trying to hide it and his mouth is bulging. A pigeon fluttered onto the stage, he immediately got a laugh from it. Needham is a great comic actor who has often had me in near tears of laughter, and matching him with Beatriz Romilly was inspired. Hero was also transformed by Anya Chalotra from a wettish sort of part to a funny and feisty one, ably assisted by Ammara Niwaz’s Ursula in the scene where Beatrice is eavesdropping on them. The eavesdropping, utilising lots of windows and doors in the set was superb when Benedick was the eavesdropper, then the production ran into what I have so often seen with this play. They repeated the doors and stuck windows stuff when Beatrice was eavesdropping, removing a lot of humour from her scene, because we’d just watched Benedick do much the same. You really should have a different eavesdropping routine and events for each of them. Marcello Cruz is a suitably sincere Claudio. I liked Steve John Shepherd’s greasy, grubby but laconic Don Pedro very much too … he had the facial reactions for every situation, playing it (as instructed) as Pancho Villa. 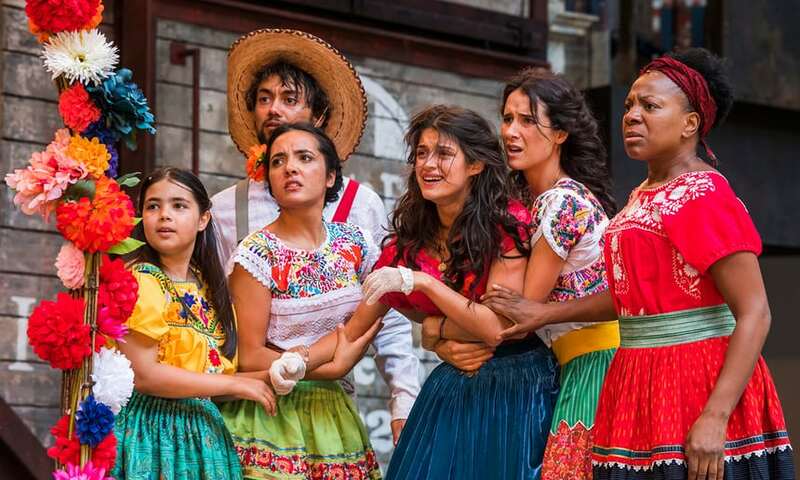 I thought the interpretation of Don Pedro as a revolutionary chief worked for 90% of the play, but couldn’t be made to match up with the lines over the supposed faithlessness of Hero and her rejection. You could take Don Pedro in Macho Ado mode, but while honour may have been spurned, this guy couldn’t be made to look like an uptight Inquisition-era puritanical prince of Aragon. Fabulous interpretation, but as ever with high concepts, some elements won’t quite squeeze into the plot. Martin Marquez was Leonato with a limp and eye patch, clearly a war veteran. He has a gruff Northern accent and, well, Monterrey is in the north of Mexico, but no one else does. I assumed the limp is real because he stayed out of the dances, and I was totally on his side as I currently have a cartilage issue and a similar limp myself. His brother Antonio became his sister Antonia (Doreene Blackstock) and that worked without any comment, an aunt serving as well as an uncle to Hero. Then we have the Watch subplot. This was ingenious, reminding me of Headlong’s A Midsummer Night’s Dream, where Puck and the Mechanicals become a film crew. Dogberry becomes Dog Berry, an American film director. To justify that he has some earlier silent appearances. Amazingly, it has historical accuracy, as Pancho Villa had an American film crew from the American Mutual Film Company, travel with him in 1915, having cut a deal for 20% of the film rights. Verges is played by Sarah Seggari (doubling as the stroppy cigarillo smoking servant Margaret) as Dog’s American assistant. The watch are three Mexicans they employ to operate film camera, lights and still camera. Fortunately, it was decided that the Mexicans spoke in their own British accents throughout. So Dog (Ewan Wardrop) has a stage funny American accent, and Verges a huge dictionary labelled “Spanish.” So Dog Berry’s malapropisms are caused because he’s trying to translate from English (here American English) to Mexican Spanish (here British English). Ingenious. I heartily applaud the decision not to rely on the original text but to introduce some new malapropisms. I expect the King’s men changed a few to suit events whenever they did it. So, when Dog wants to accuses Juana by saying “Juana is a villain” from the dictionary, he misinterprets and says “Juana is a virgin.” The Watch catch Borachio and Conrade by filming them … but as it’s silent, they then have to make title boards with the incriminating lines. Projected B&W film must be a Globe first too. Maybe we only needed to see it twice, not three or four times though. Reviews seem uncertain quite how well it works … I’ll go with “Fabulous idea”, but inevitably a tad stretched with the script. They got a fair bit of humour about Mexican attitudes to Americans … the Americans were supporting the other side in the Mexican Revolution, but it echoes with Trump’s wall. Not that that was made explicit (for a change in 2017). But it was off in pace, and that’s a major fault for a comedy. I thought that the good ideas had crowded in and almost fell over each other for inclusion. I’m still trying to work out how they shot tin cans off the train roof. Comedy needs a degree of speed, and at several points, stuff slowed it down. After a great noisy, wordless part as everyone arrives and the wounded man is carried to the train on a stretcher, it fell flat because they gave the crucial intro lines to a child soldier. No criticism of the child soldier who danced and acted very well throughout, but the first lines in a Shakespeare play need focus and gravitas. When I saw the wounded man carried in, I thought ‘Ah, this will be the messenger.” It wasn’t. The worst example of slowing was the grave scene where Leonato had to limp down through the audience and add a bucket of pebbles to the stones on the island platform, which had been carefully rearranged in the interval. Then he had to limp all the way back, get a large wooden cross, make his way back down the steps, through the crowd and back onto the platform. Minutes passed for a very short scene. It ran to three hours including interval. It never felt too long, but it felt at several points as if it was suddenly grinding slower. I’d say it’s a ten to fifteen minute cut away from being a five star production. 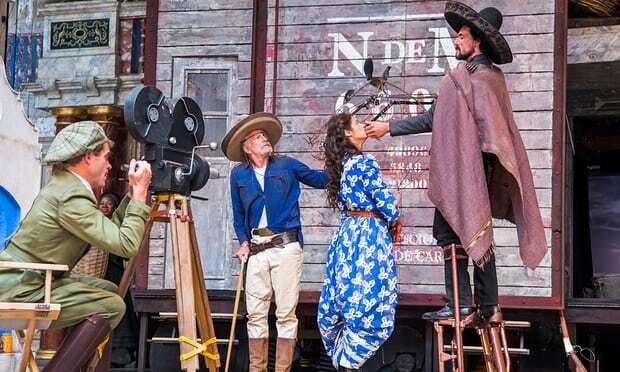 Dunster is more interested in Tex-Mex tropes and trappings and, quicker than you can say ‘cultural appropriation’, his actors are chewing cigars, slamming tequilas and shooting tin cans to a mariachi band score. Flag up false representation all you like, but no amount of self-awareness excuses perpetuating those clichés. Not at a moment when Mexicans are so vilified; not as the chant of ‘Build that wall’ rings out across America. Not the only one. Other reviews felt uneasy about the sombreros, gun belts, moustaches. More especially about people slumped on the ground, covered by a blanket and sombrero. At least they eschewed all the por favour / Si Senor possibilities. The director and designer researched it in Mexico, and there are plenty of photos. I was surprised in Monterrey in 1980 to see people sitting on the ground just like that. I apply my “I have a Mexican friend sitting next to me. Would I be embarrassed?’ test. It’s Serge Leone’s Mexico that’s for sure, the kind of Wild West Tex-Mex gun-toting image of Mexicans that Mexicans generally dislike. Just as they will rapidly tell you that chili con carne is too vague a description to be from anything other than the USA. On the other hand, of all the nationalities I’ve taught, Mexicans were the friendliest and best-humoured. When we did our comedy shows for English Learners, we had a sketch called Viva El Presidente! which was about a firing squad in sombreros about to shoot the blindfolded ex-president, who has many last requests, and every time his name is mentioned the firing squad dropped their rifles to shout Viva El Presidente! They loved it. We also had a Mexican in our classroom sketch, Maria-Consuela Margarita Lupita Guadalupe Garcia y Perez, and Karen accumulated several Mexican costumes donated by Mexicans who thought her appearance could be improved. So, Mexicans are not as likely as many nationalities to take offence at stereotypes, but is it stereotypical? Is the Pope Catholic? Why does The Globe persist in ignoring composers? P.J. Harvey’s sublime song, The Desperate Kingdom of Love, as sung by Hero, is a high point of the play. Is there no room to credit her among the very long lists of Globe employees? Surely she’s a co-composer. Surely she needs the space the musicians got. Her words carry 3 to 4 minutes of the entire play. The programme synopsis covers the plot well, but it looks cut and pasted. There is no reference to Mexico, Don Pedro is “The Prince of Aragon” which he clearly is not here, and Don John has just been changed to Juana. Dogberry is changed to Dog Berry, but it describes the watchmen, who have been replaced by a film crew. Very poor. Excellent interview with Matthew Dunster though and a clear essay on The Mexican Revolution by David Hall.